A quick note just to big up the lyrical warriors and poetic messengers that stepped down from Birmingham to be part of the Zeitgesit Orchestra for Friday nights show with Broad Minded. Wasif (The What Supreme – verbalist) and Tom (Sensei C – verbalist/clarinet) play out as the duo HLI (Headlighter Islanders) but like proper scenesters are involved in all kinds of activities. On Friday and Saturday they took their heat over to Manc for Drongomala and Flying Mountain. The electroraga piece was a beautiful thing and everyone pushed themselves out into that jazzy primal scream therapy territory that is needed to pull off a 14 minute unrehearsed jam. HLI dropped their live set afterwards and the night couldn’t hace been inaugurated better. ….on the Saturday we then dropped two jams in spooky electric (my studio). Ep in the summer sometime. Big Up Wasif and Sensei C – the real spirit of hip-hop runs through these guys. 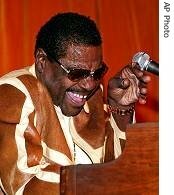 The great singer-songwriter and performer Billy Preston, the “Fifth Beatle” has died after a long illness as a result of malignant hypertension that resulted in kidney failure and other complications. He dies in Arizona where he’d been in a coma for nearly a year. I’ve heard alot of Billy’s playing but I haven’t seen a whole lot of him playing on film. The one bit of footage I do know is the where the beatles are trying to make abbey road and there is alot of bad sniping going on between the fab four arguing like spoilt kids Then Billy comes in – boom the atmosphere changes and all of sudden the beatles get busy making music. Everyone is smiling ..the playing has improved..the Beatles want to impress Billy…..